After our service's commission, the total is $27.72. Please send payment to greeneswitchblade@gmail.com with your username in the notes! **o0vailo0o, Would you like to offset it against the stuff I'm getting from you? "They are in my possesion, I have yet to open the box since I've been passed out until today. I will be posting maybe tomorrow once I get all the fees and stuff tallied up. SMJ box came on Monday, uhh, box looks fine, but unopened yet. Might end up doing a little livestream so people can see them. I think that covers it all? I think last payment will be including the shipping to warehouse, shipping to me, then shipping to them." 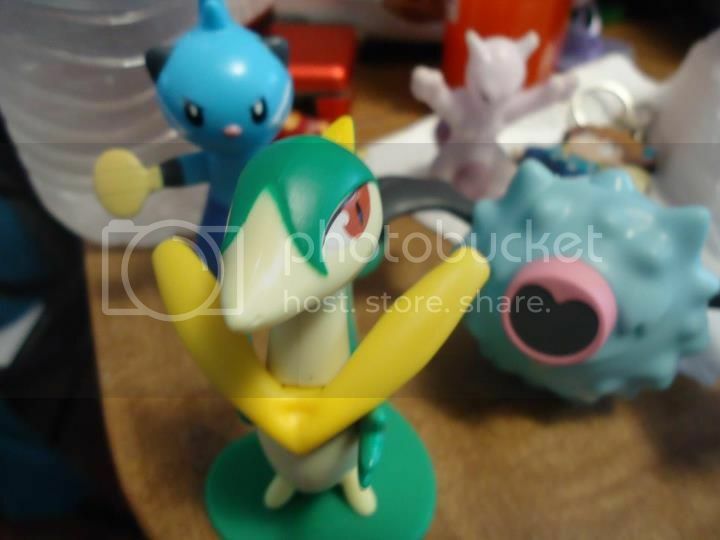 And I have a few, random Pokemon figures that I'm willing to trade. Hi guys! I'm doing a little collection weeding so I have some stuff for sale such as a binder of cards, a Raichu Canvas Plush, a Zoroark movie keychain, some charms, and lots of TCG coins. Also my remaining McDonald's toys with the prices lowered! Click the cut to see more! I really want white 2 from japan! but ebay prices are ridiculous. I was wondering if anyone here from japan would be willing to sell it for like $50 shipped? You would be my best friend. If anyone can help me, or knows a site that does overprice them, please let me know. 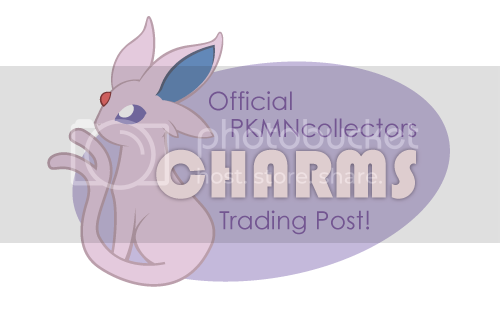 ~ALL NEW~ Official charms trading post! Okay, so the last trading post got really out of hand eventually due to LJ's editing system :\ But it looks like it was really handy for a lot of people, for a pretty long time all things considered! So I'm thinking the best thing to do is start a new one! So I decided to slash my prices on some Ebay lots and added a new one! If anyone here would like to GA it I'd be more than happy to combine them all in one box. I just thought it would be better making them three separate lots than overwhelming everyone with a huge lot. 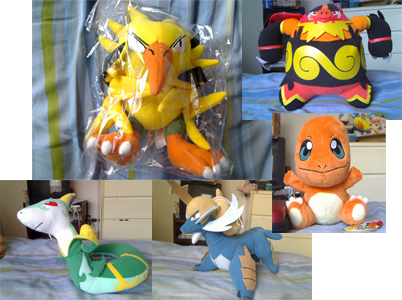 This one consists of Banpresto plush, pokedolls, Jakks, Plamo set, kids, dice, clipping figures and more. This one is my new lot, it consists of laying plush, banpresto, kids, charm straps, cards, pre order figures and ext. And I'm still on the look out for this zukan set, I gots da moneh. Hello folks! This is a reminder that my auction for Tomy Bulbasaur and Venusaur NIB Battle Colosseum figures ends within 24hrs. Venusaur still has no bids! Click the picture to proceed! Also, this is a reminder about the additional slots for Banpresto I <3 Eevee Keychain Plush (Eevee, Leafeon, Umbreon, and Vaporeon) I have opened to help the people affected by the recent donny9 community sales ban and the subsequent Banpresto Pre-Order cancellations. As mentioned, this is only open for people who want to get the entire set of four, so click here if you are interested! I will only be entertaining singular requests for Leafeon and Eevee from the 1st Wave, but singular claims for the 2nd Wave (Jolteon, Flareon, Espeon and Glaceon) are still available. I stop taking orders for the 1st Wave this week. Jurassic Park III? A Darumaka's stretch marks? A ripped couch cushion? Stay tuned! Have a great week ahead! Well life has picked up for me, and with a new job i cant resist the temptation to collect again :P I am currently selling what i dont need here on my Ebay page: http://www.ebay.com/sch/shaggygriffon/m.html?_nkw=&_armrs=1&_from=&_ipg=&_trksid=p3686 (sales perm aug 2010) but i am willing to trade any/multiple of those auctions for one thing im hunting, the 1:1 totodile. I know its a long shot, but crocs/gators are my fav animal and i only want that big guy to sit in my collection, plus my 1:1 cynda needs a lifesize buddy. commet or skype me and we can work something out (shaggy.griffon on skype) thanks guys! Gorgeous get, re-auctioning GA items, and a want! Next, I wanted to re-auction most of the items that were in the GA that didn't sell. I took some new pictures so that you can see the items better. I know that there are figures, but what's out there? Also, are there plush? If not, are there people who I could commission for cheap to make a small plush? How do you like your kids? Pokemon kids, that is! I'm thinking of buying a set of MIB kids online (it's cheaper that way, since I want most of the set) and I'm wondering whether I should ask the seller if they can flatten the boxes to help save on postage. The thing is, I'm not sure if that would hurt their value in the future. They'd still be MIP and I'd still have the box (and papers, if these kids do come with them). What do you do / prefer, collectors? Personally, I'd prefer them just to be MIP so that I can display them while still protecting them, and I'd just keep the box + papers somewhere else, but that's just me. 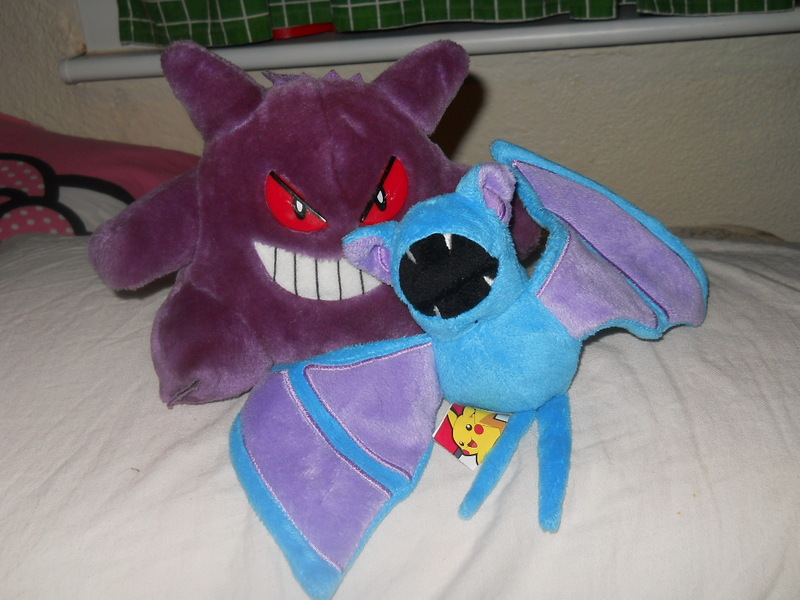 Marshtomp and Kyogre Recall Plushies!? i Hi Everyone! I not long ago bought a Recall Kyogre Plush and he is one amazing, huge plush! Love him to bits! But the problem is that I don't know how much these go for? I brought him for about £50...Was that a good buy or what? Also how much is the fantastic Marshtomp plus worth with tag? :) Thanks all! facebook group pokémaniak collection systems and many things ! I have got a FACEBOOK GROUP of my nintendo collection with many daily updates. please introduce yourself before by private message before ! This time I bring you quite a few figure ~ and some more ditto stuff! AUCTION IS OVER! THANK YOU! Please see totals here: Totals Spread-sheet here! Mind sharing your secret with me? Hey, guyz, I was wondering that keywords do you use when you search stuff in Yahoo Japan, because you always have awesome stuff for GA and I can't find anythint decent, what's wrong with me? EDIT: I mean, when you search for lots of random stuff and million plushies. I am not terribly professional at introductions, so do excuse my awkwardness, as I reckon I can get a bit silly. I would care to introduce myself: perhaps, rather re-introduce, since I was part of this community quite a long time ago (at least a few years!) but have recently been eager to join again. Allow me to begin with the basics. My name is Ayva, and I am a fifteen years old female who currently resides in Massachusetts, USA. I have adored Pokémon since I was young and began to collect in 2008, and I have been doing so since. I left this community some time ago due to loss of interest, but, as I mentioned previously, I am very delighted to come back since my passions have been sparked once again. As for what I collect, as I am sure that should be the entire relevance of this post: I love to collect specifically plushies and figures, but as well as any other items, such as charms, keychains, stamps, pins, and so on! I adore Glaceon, Terrakion, Zorua, Zoroark, Emolga, Minccino, Serperior, Whimsicott, and Gizamimi Pichu! These are the Pokémon I mainly strive to collect. So, without further ado, allow me to present some photographs! Please take a look if it behooves you! I am very pleased to once again be a part of this community! I look forward to meeting new people and expanding my collections! ♥ Thank you for reading, and enjoy the rest of your day! Just a little update.for those of you who have participated in the wailmer and friends GA. I have the items but I'm waiting for the Mewtwo GA to come in (since a lot of you participated in both), but if it doesn't get here in the next two days I'll go ahead and get the 2nd Wailmer totals. Tell rhys if you want them shipped together. Last thing! Does anyone know about the official Joltik plush? Like what brand they are and stuff like that. That's it from me today! Sorry if I'm not in the best of moods, I am very annoyed with something. Have a wonderful rest of the week! We were unable to raise enough money for the starting bid, which means of course that we lost. I spoke to littlezorua before that - She said she was really hoping to move the lot, but this morning I received a message saying she'd rather relist the items seperately. Which is totally fine! I just wanted to clear this up since the re-listing may be confusing. Ah, and my box of goodies contained a grail! I'll post about it tomorrow. Here's a teaser pic. Just selling off some extra McDonald's figures I've picked up recently. I was granted sales permission on 11/18/2011 by dakajojo. Shipping for figures will be $2.50 domestic (US), $3.50 international. Shipping for cards will be an even $1 no matter where you live. Also, for those of you with some time to kill, my friends and I produced a compilation video of our drive-thru experience asking for Pokemon toys. A lot of silly hijinks abound, and there's some NSFW language, but it's funny if you've got the time. I also do on-the-spot reviews of each figure I get during the video. Many members have been feeling confused about why donny9 lost sales permission; while the mods spent days in talks with him to determine what action would be taken and finally settled on the sales ban, we did not feel the situation was critical enough to warrant a warning post to the entire community, and simply informed as many people as we could who were connected to his preorders and "group buys". We also added his partial ban with a small explanation to the Wall of Shame. BUT it seems the message did not get out to enough folks, and some members feel very angry, betrayed, tricked, and flat out ripped off. While donny9 is currently only under a partial ban, he has begun to flood facebook, ebay and his own LJ with his wares. As all of his preorders on the community had to be canceled with th sales ban, he is urging people to buy from him elsewhere instead, and pay immediately. We finally decided to make this post as it turns out he is again lying to members and misleading them about why he got sales banned. Naturally we can only halt advertisements on the community, and all members are free to make purchases from anyone they wish outside of it. However those who feel cheated and mislead have requested this modpost so that everyone can be aware they are buying at their own risk. That, then, concludes the details I can present at this time. Again, I am choosing to present them now, when before I deemed it unnecessary drama, as donny is flooding other sites with sales, deleting references to his sales ban on pkmncollectors, and lying to members that he only got in trouble for a messed up GB and nothing more. I'm afraid my choice not to make a scene may have inspired the idea that this would be overlooked, and I apologize. Feel free to comment with your opinions, but be fair, and remember that abusive or bullying language will not be tolerated in the comments, as donny may read or participate if he wishes to reply. This post is to explain to the confused, give some justice to the cheated, and let you all make your own informed choices as buyers. But buyer beware (this goes for any online shop): If a seller is advertising an item as "super rare, limited, sold out quickly, only sold for one month", etc., please be skeptical. Especially if the item in question is not even released yet. Yes, some items are limited (Namco releases for example, and some Pokemon Center items) and some things do sell out quickly (again, some popular Pokemon Center promotions IE; Stunfisk!!! And Subway Bosses/N! ), but 99% of the time the things I see being advertised as "SO RARE SO HARD TO FIND" are things I know have been in stores in Japan for half a year and are still there. You are all, for the most part, very informed Pokemon Center buyers. You know the release dates, shelf prices, you know to buy things quickly is safest but that waiting a little while is usually not a problem as most items remain in stock for months. 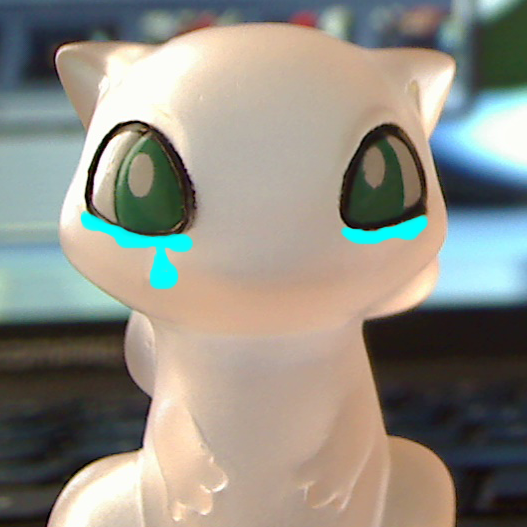 With Banpresto being game center prizes and having no shelf price, it can be harder and cause a bit of panic, especially with things like Eevees. But these items will be common for quite a while before their prices begin to skyrocket months later. You DON'T need to be on some preorder list for Banpresto items to be able to obtain them. Things like this, and seeing people sad or upset they missed slots on things like Ichiban Kuji prizes, zukans, kids, etc, is another reason I wish to promote becoming comfortable using Yahoo!Japan deputy services, and finding out how to make them work for you, and build an order up so you are not spending exorbitant amounts for small cheap things. Once you can work Y!J, you can also do group buys -- real ones! -- to get items like Banpresto plush at insanely cheap prices. Note again that abusive language or bullying behaviour will not be tolerated and will have the comments shut down completely if it gets out of control. If you are worried your opinion will be unpopular and cause arguing or drama, just send an email to me personally at denkimouse (at) gmail.com so we can talk together. See you guys later with a June MPC post. Thanks for reading. Pikachu Canvas Plush MWT- Unsure?